If you’re having an emergency and need or want to dry your hair as fast as possible consider the following quick hair blow drying secrets. Keep in mind that while the secrets and tips listed below may speed your hair drying time, there is a risk the added heat required may dehydrate delicate strands. 1. 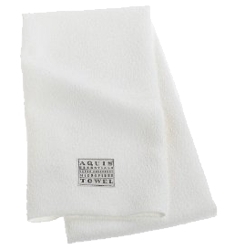 Towel blot newly cleansed hair with a super absorbent towel to remove excess moisture. 2. Blow dry hair in a different room from where you washed your hair. The heat and steam from the shower creates excess moisture and humidity which is inadvertently absorbed by the hair. This excess moisture adds to the drying time. 3. Use as few styling products as possible. The more products you use the longer it’ll take to dry your hair. Remember that less is definitely more. 4. If you separate hair into individual sections before blow drying, remember that the larger the sections, the longer it will take hair to dry. 5. 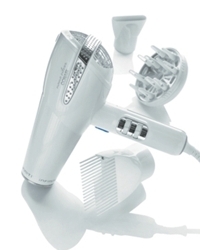 Switch to an ionic style dryer designed to speed dry hair. 6. Select a blow dryer with a 1,875 watts of drying power. The added wattage will speed up the drying process. If you do decide to use 1,875 watts of drying power be sure to use a heat protectant product before you begin. 7. Use a blow dryer with a concentrator attachment and direct heat from the concentrator to areas where it historically takes longer to dry. 8. Start the hair drying process by first rough drying towel blotted hair with fingers. Blow dry until hair is 95 percent dry. After hair is 95% dry blow, smooth with a 100% boar bristle brush and a round or paddle brush. 9. 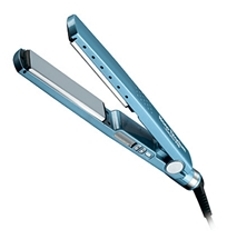 Add instant shine by running through dry hair with a flat iron. 10. Finish with a drop or two of shine serum massaged into the palms of your hands and swiped over the top of the hair. This seals in moisture and amps up shine. – Use two blow dryers at the same time to get double the blow drying results. This can be a little tricky to accomplish since both hands will be utilizing dryers at the same time but in an emergency it will do the trick. 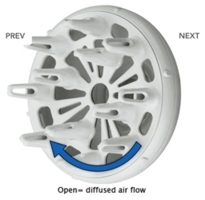 – Direct the air flow from the blow dryer down the hair shaft from roots to the ends. – Never direct air from from the ends to the roots unless the goal is to add volume to the hair. While there are shampoo products which advertise that they can speed up drying time, the downside to these types of products is that they tend to be drying for the majority of people. Keep in mind that not all products, tips or hair care secrets work equally well for everyone. I have rough hair so it takes longer for my hair to dry than several of my friends who have fine or thin hair. Experiment with the tips listed above and be willing to create some of your own shortcuts. In fact, if you have some of your own secrets of how to speed up the blow drying time please share. This entry was posted on Wednesday, November 23rd, 2011 at 11:58 pm	and is filed under Hair. You can follow any responses to this entry through the RSS 2.0 feed. Both comments and pings are currently closed.